Hand drawn and digitally light shades printed onto Perga parchment. Inspired by aspects of nature, memorabilia and architecture from Rachel's personal and parental heritage of Myanma (Burma) and Scotland. Available as pendant or lamp fittings in small drum, large drum and shallow drum. 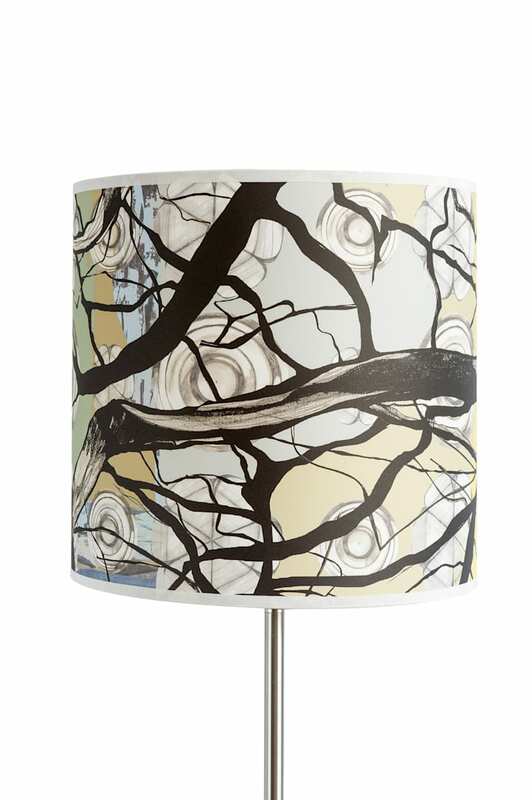 Inspired by the theme 'Family Tree' drawings of branches, buttons and textures are displayed within the pattern of this large Drum light shade. Hand drawn and block printed design digitally printed onto Perga parchment. 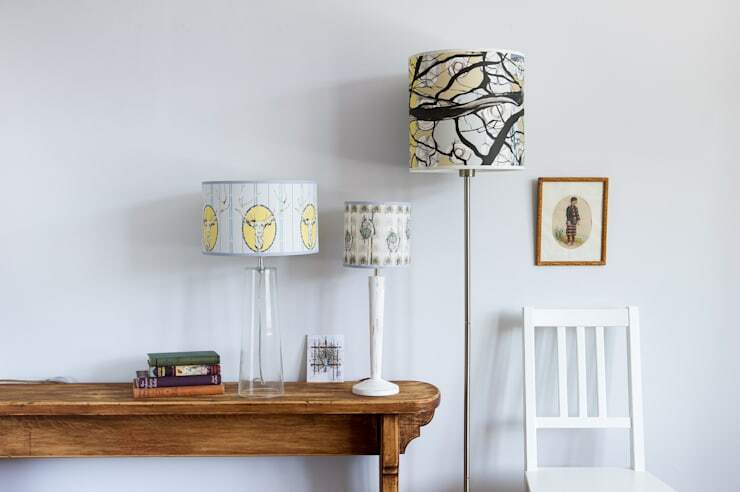 30.5cm D x 30cm H.
A range of hand drawn, block printed and digitally printed light shades. Small drum, large drum and shallow drum available in pendant and lamp fittings. 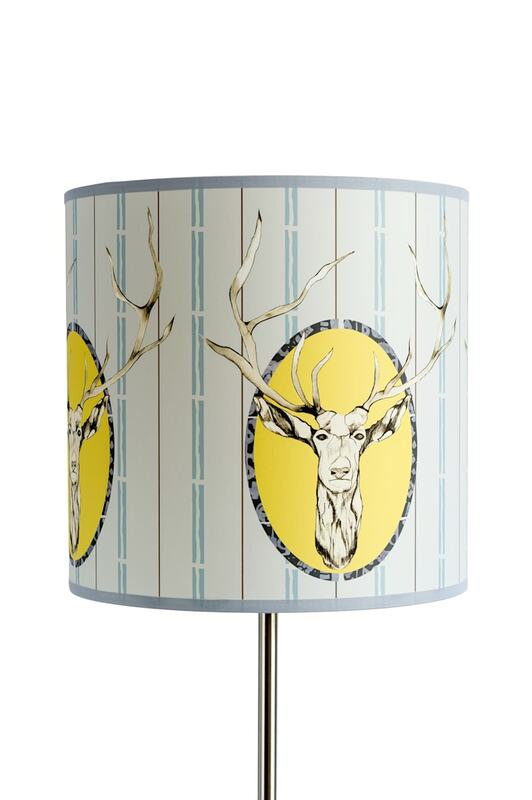 Hand drawn and digitally printed light shades large drum 30.5cm D x 30cm H. Printed onto Perga parchment. This design features Stags, inspired by aspects of nature, memorabilia and architecture from Rachel's personal and parental heritage of Burma and Scotland. Available as pendant or lamp fittings and as small or shallow drum sizes. 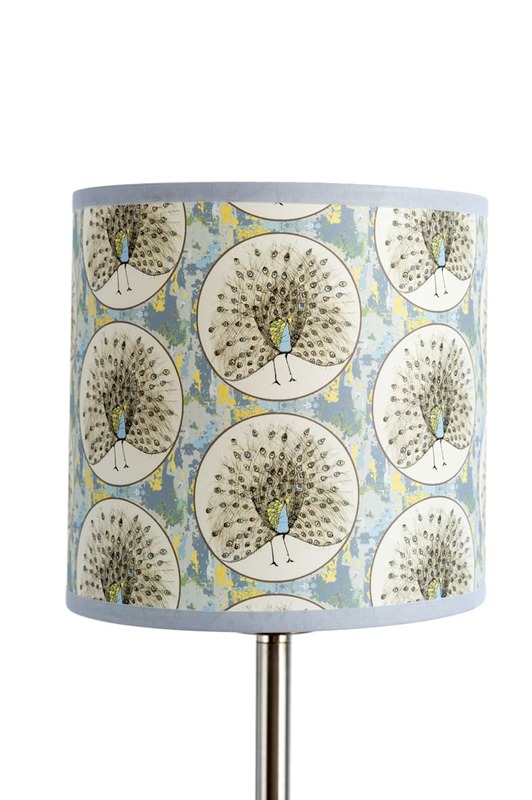 Hand drawn and digitally printed light shades small drum 18cm D x 17.5cm H. Printed onto Perga parchment. Inspired by aspects of nature, memorabilia and architecture from Rachel's personal and parental heritage of Burma and Scotland. Available as pendant or lamp fittings and in large and shallow drum sizes.